Students enrolled in our private lesson program will get to work towards performing at our electrifying concerts hosted at C’est What. While the performance is optional, here at Beyond the Beat we deeply encourage students to participate, as it is not only a great experience but it also provides an invaluable opportunity to put out practiced work in an enriching, supportive environment. Aside from the concert, students will also learn to improve their playing abilities and gain confidence with their instrument in our half hour or whole hour lessons. Half hour lessons are great for younger students or students who may already have a lot of commitments. An hour lesson is an excellent choice for an individual who really wants to target their musical talent. Beyond the Beat is happy to introduce its newest feature: collaborative lessons. Now students can take lessons with a friend or a sibling! We believe that musicianship is gained not only through technical mastery, but also through teamwork and collaboration. We are pleased to offer these collective lessons for voice, keys, guitar, bass and drums (you can mix and match!). Please enquire about pricing and scheduling here (minimum 1 hour lesson is recommended). There are Three Semester during the year as we follow the educational systems calendar. We also offer workshops, summer intensives, production programs and beat making programs. While still focusing on proper vocal technique and warm ups, our vocal teachers encourage students and their parents to suggest and bring in contemporary song selections. During a lesson, voice students will work on their own versions of their favourite songs or their original creations. Our drum expert approaches all lessons with flexibility and focus. Above all else he is committed to helping students reach their full potential. Incredibly skilled and dedicated to his craft, there isn’t a pop song that he doesn’t know or will not learn. Well versed in all genres of music, John provides students with the support they need to play the music they want. His ability to transcribe drum lines from songs makes reading music and playing along to the songs of your choice an exciting experience. The guitar is arguably the most popular instrument on the planet and acts as one of the main mediums for songwriting. 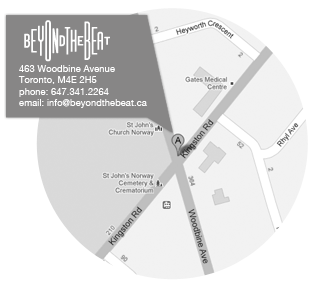 Beyond the Beat’s guitar program is conducted in soundproof booths and offers teachers who are current in the music industry. No matter if you’re just starting or have been playing for years they possess the versatility to adapt to any and all skill levels. An expressive instrument that can be used for many different purposes and genres of music, the piano is often the first instrument of choice for students. The piano acts as a gateway that makes learning other instruments less complicated . It improves the ability to read bass and treble clef, as well as your capacity to arrange music, and chord structure. Our piano program has teachers that encourage younger students and nurture the development of advanced students. Based on the Suzuki method, we approach violin lessons with the professionalism and expertise necessary when teaching a classical instrument. This helps students to enjoy playing classical music and helps them to understand the importance behind such a historical instrument. In addition to this structured way of approaching the violin, we also make sure to include a focus on popular and folk music to showcase the multitude of genres this instrument is capable of. Thanks to the versatility of our teachers, Beyond the Beat’s folk music program is extensive. Among our many instructors who have experience in folk music, Rob McLaren, our mandolin teacher, plays folk music professionally and often tours with his band (you can read more about Rob and his music endeavours here). At Beyond the Beat we are so happy to be able to teach folk styles on multiple instruments. Folk music has such a huge repertoire and we encourage students to explore and enjoy playing this genre.